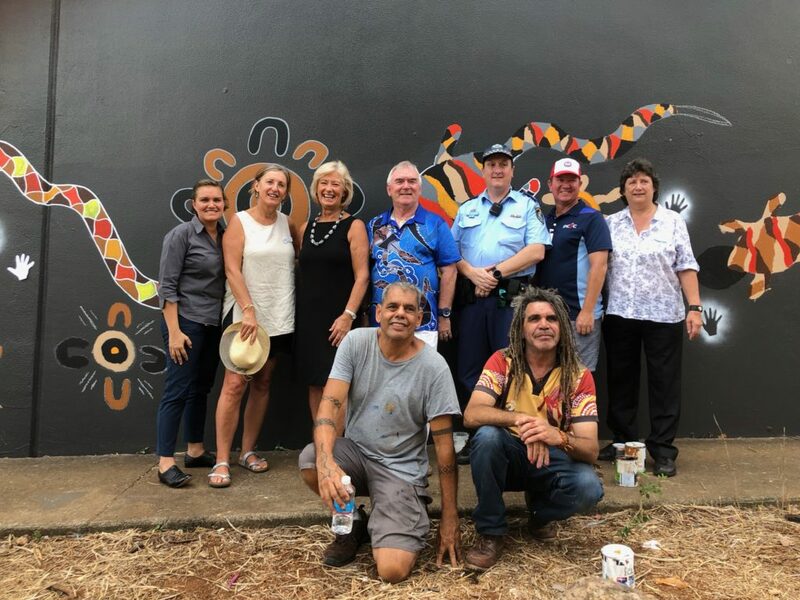 Goonellabah’s Aboriginal culture was creatively acknowledged last week through the completion of the region’s latest street art in Eggins Place, Goonellabah. Additionally, a two–part specially designed mural was also completed on new backboards purchased for the regeneration of Elders Memorial Park. These improvements are part of two projects being implemented by North Coast Community Housing with over $100,000 funding from the NSW Government’s Social Housing Community Improvement Fund and support from Lismore City Council, Lismore PCYC, Lismore Police, St Vincent de Paul Lismore and HARP – HIV and Related Programs. “This was a fantastic youth event highlighting the heartbeat of this deeply connected community. North Coast Community Housing is just so excited to see what this funded redevelopment will unlock in the lives of local young people who call this space home” said Robyn Hordern, Chair of North Coast Community Housing. “We are so grateful to community for coming out and joining with us to celebrate the commencement of the works and have one last bounce on the old court before it is totally transformed,” Ms Hordern said. 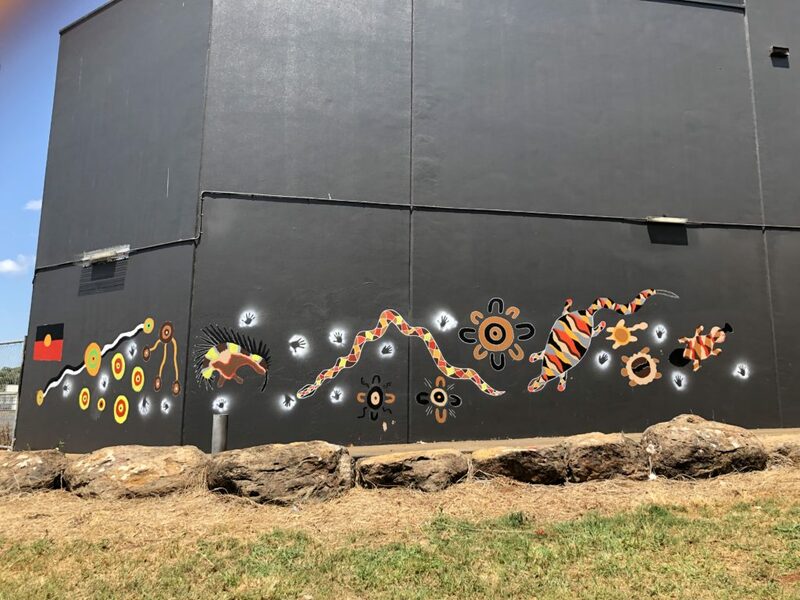 The rear wall of The Village Goonellabah is now the latest urban canvas to be totally transformed by local artist Gilbert Laurie. 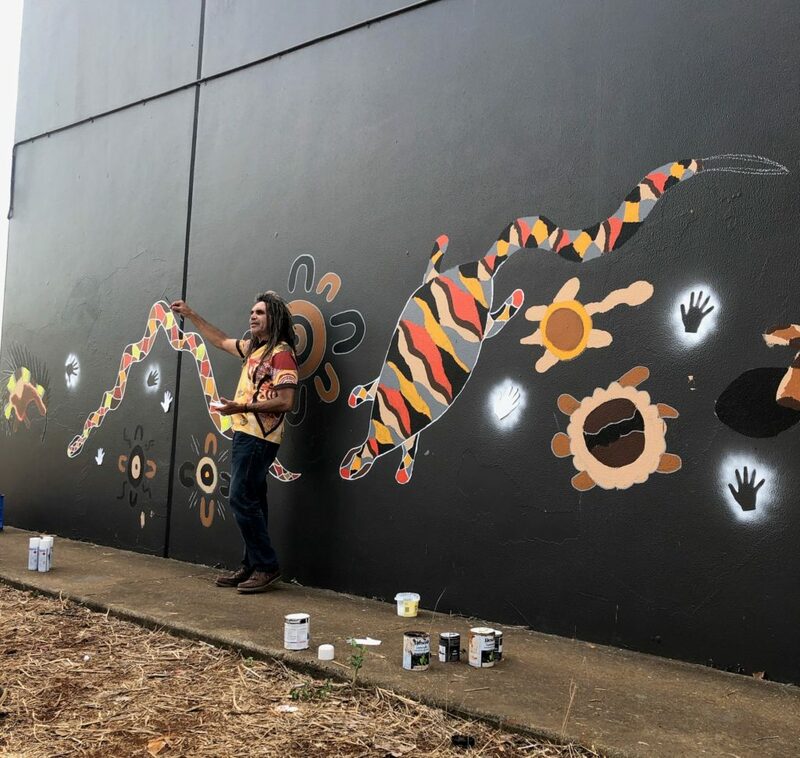 The participatory painting was a highlight, and Gilbert’s explanation of the Aboriginal symbols fostered increased ownership and pride within the local youth who took part. 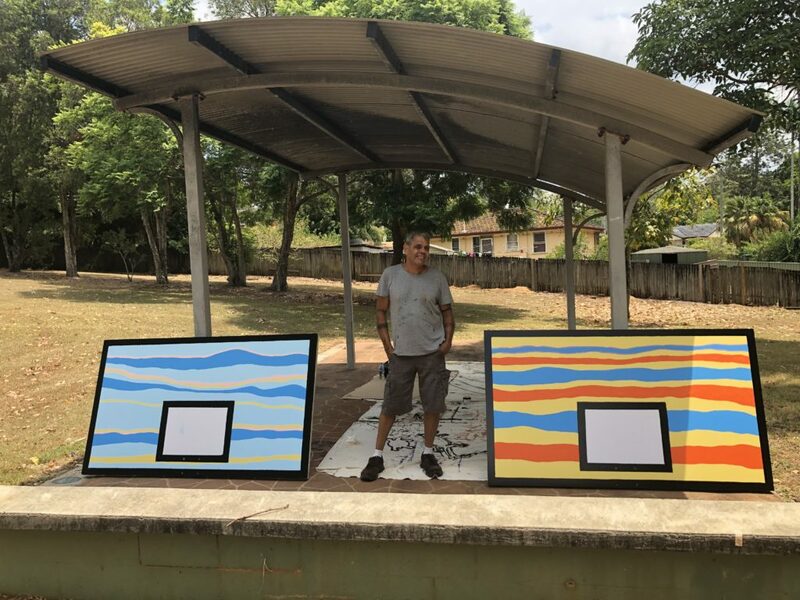 The funded basketball backboards now feature magnificent artworks depicting a sunrise and sunset designed and painted by local artist, Luke Close. “The sunrise and sunset, along with the beautiful blue planned for the basketball resurface signify one entire day. Local youth will soon play on a court which actually is a metaphor for 24 hours. What I want youth to ponder as they play is to ask themselves What did I achieve today? What decisions did I make? What choices can I make tomorrow? This court signifies hope” explains Luke. “With this redevelopment we are excited to see a reinvigoration of the basketball tournaments that once were held”, said Project Partner and PCYC Manager, Greg Ironfield. Another component of the larger project aims to improve public safety and includes the installation of additional street lighting in Eggins Place, and a disposable sharps container to reduce harmful waste. The event saw a staggering 80 in attendance across the two days, signifying a new day is dawning in beloved Goonellabah. “North Coast Community Housing especially wish to thank our event sponsors who helped make today possible including St Vincent de Paul, Coles Goonellabah and especially, The Village Goonellabah, who own, and manage, this Goonellabah Shopping precinct. The building owners and management team supported us to deliver a blank wall canvas for Gilbert to work with, and funded a local youth entertainer to face paint across the two days”. These projects were made possible through two successful North Coast Community Housing tenders ($104,000 in total) from the NSW Government Social Housing Community Improvement Fund. Formal Project partners include: Lismore City Council, PCYC, Lismore Police, St Vincent de Paul Lismore and HARP – HIV and Related Programs (Health NSW Needle Syringe Program).